I went for a walk in my new boots the other day. As my dad says, you ain't been for a walk in your new boots until they've got muddy. Well they got muddy! But for possibly the first time ever in my life I've actually taken care of something. I got them home, knocked the dried mud off of them, washed them off with some warm water, and gave them a coat of dubbin. 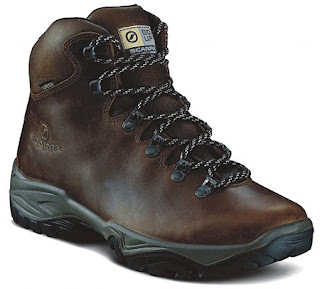 I'm not the kind of girl who has a pair of Jimmy Choos, so at £100 my Scarpa Terra GTX my boots were quite expensive by my standards but I hope that if I look after them, they'll pay me back. Out of the box they have a slightly worn look about them being made of tough oiled full grain leather, which coupled with a lack of stitching should make them durable. A firm heel and toe cap to protect you in rockier places and a supportive ankle cuff finishes the boot. On the bottom is a Vibram sole, with a good tread thickness. They weigh in 1000g for a ladies size 5, making them a relatively lightweight leather boot. Finally for the exterior, the tongue is attached to the upper to prevent water and mud getting inside the boot. When I put them on they feel instantly comfortable. (I wore them round the house on Christmas Day much to my gran's horror!). The ankle cuff is highly padded and overall they feel cushioned. They have a breathable Gore-tex lining, to ensure that water stays on the outside, so no more wet, soggy, cold feet for me. The laces are just about long enough to tie. So what did I think on my first walk with them? Well we covered a good few miles at a reasonable pace and overall they were comfortable and no sign that they might give me blisters on a longer hike. I was conscious of the higher ankle cuff, which my old boots didn't have, and how that felt as I walked and I hope it is not going to turn out to be a negative as I get more used to these boots. On the relatively flat and muddy ground, they performed well and felt good. But they need more testing on more uneven, slightly rocky terrain before I can make a judgement.